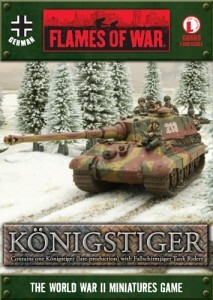 Battlefront previews their new Königstiger with Fallschirmjäger Tank Riders for Flames of War. And no, I have no flippin' clue how to pronounce that, either. During the Ardennes offensive, Peiper’s regiment was reinforced by the 502. SS-Schwere Panzer Abteilung (502nd SS-Heavy Panzer Battalion). This battalion was equipped with the Königstiger. Their slow speed and bulk placed them at the end of Peiper’s column at the start, but when they began to encounter strong American counterattacks, these nearly invincible beasts proved essential to the mission. Contains one Königtiger (Late Production), five Fallschirmjäger Tank Rider figures, two Tiger Ace dice, one Decal sheet and two Rare-earth magnets. In store from 18 August 2012.